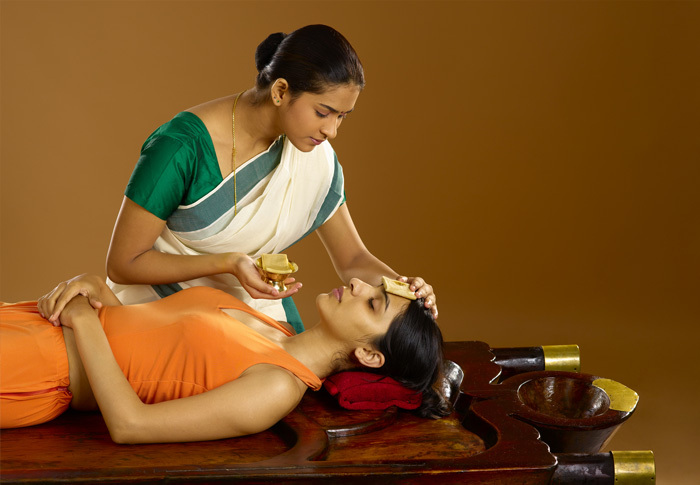 Gods Own Country Ayurvedic Resorts provide the best ayurvedic treatment for skin diseases in Kerala. Having a decade of experience in treating skin related diseases, at Gods Own Country ayurvedic resorts , we analyze each individual followed by proper ayurvedic disease diagnosis and then the treatments are prescribed. We provide the best ayurvedic treatment for skin diseases in Kerala that is unique to each individual and their body type(dosha), identifying the underlying factors in the ailment. The concept of beauty and cosmetics is as old as human civilization. As Ayurveda the concept of beauty has an age old origin. It is not possible to get away the process of aging , but we can let it not come very early with ayurveda and its natural herbs. According to ayurveda healthy skin is a result of overall health condition of individuals and prescribes numerous skin care treatment that needs to be pursued at every stage of life. Being a mirror, the barometer of an individual's health, skin is the clue to one's ayurvedic constitution. If the skin is not cared properly and neglected it suffers from the premature ageing, becomes dull and blemished. As in any holistic medicine, inner and outer radiance and aging are closely related. The more we nurture ourselves, the more radiant we become mentally, physically and emotionally, regardless of our particular body shape or proportions. Ayurveda emphasizes beauty as being a product of the four dimensions, physical, mental, spiritual and mental health with high importance given to self - knowledge, positive environment, development of positive routines and habits. Aging causes dryness and wrinkling of the skin. Factors like excessive thinking, stress, tension, over work, strain, irregular sleeping and eating habits and cold or dry foods enhance aging. Foods containing artificial flavors, colors, preservatives and chemicals also aggravate the vata dosha and fasten aging. The Ayurvedic treatemnt for skin diseases in kerala by Gods Own Country Ayurvedic Resorts is through ancient time tested herbs that helps to enhance your beauty and rejuvenate the skin naturally. We provide ayurvedic skin care treatments that are herbal, non toxic, non irritant and help to maintain health and increase the beauty of your skin. Unlike chemical cosmetics, our ayurvedic beauty therapies make use of ancient time tested products which are natural and plant based. Our ayurvedic beauty therapies for skin care rejuvenate the skin, improve lusture, tone, complexion of the skin, delays aging etc. Our skin care treatments are effective in common skin problems like dry skin, dark circles, acne, blemishes, wrinkles, freckles etc. The ayurvedic treatment for skin diseases in kerala at Gods Own Country Ayurvedic Resorts retains texture and beauty of the skin by ensuring the proper circulation of vital life fluids and the regular discharge of waste materials through therapies such as Panchakarma. Nothing helps the body more than routine care and nurturing through tools such as massage. In the Ayurvedic tradition, massage is considered just as essential to overall health and beauty as good diet and positive style. An Ayurvedic facial massage activates deep centers of the brain, reflex points and facial circulation to totally soothe the body, Tensions in the neck, shoulders and face are freed and energy is rebalanced from head to toe. Herbal extracts and essential oils are to be added for their additional healing properties and pleasant fragrances.